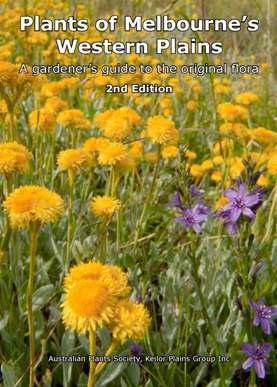 "Plants of Melbourne's Western Plains: A Gardener's Guide to the Original Flora, 2nd Edition"
223 pages. Fully illustrated in colour with 500+ photographs, maps and diagrams. Botanical and common names identify most of the local indigenous plants that are available in nurseries, together with each plant's favoured growing conditions, mature size, flowering times, whether they are bird and/or butterfly attracting, and more. Available from local nurseries (especially local indigenous nurseries) and local bookshops. RRP $19.95. If it isn't in your local outlet, ask them why, and ask them to get it in for you. For enquiries about large orders, please contact kpbook@apskeilorplains.org.au. Bookshops must place orders via Dennis Jones and Associates. The grasslands of Victoria’s Western Plains and similar plant communities in the Northern Plains contain the highest proportion of threatened plant species in the state. Grasslands now cover less than 1% of their former extent on the Keilor-Werribee Plains and less than 1% in Victoria. 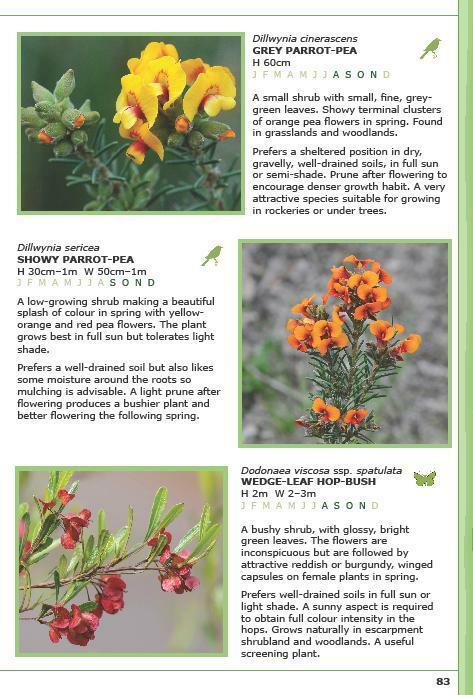 This book is a valuable guide for people wishing to grow western plains plants in domestic gardens, parks and revegetation projects as well as everyone who wants to learn more about the rich diversity of flora to be found in remaining plains landscapes in Melbourne’s west and throughout Victoria. A book for gardeners, environmentalists, local communities — anyone who cares about protecting and enhancing our natural heritage. Foreword by Neville Walsh, Senior Conservation Botanist at the Royal Botanic Gardens Melbourne. Sections on the geology, soils, rainfall, landforms and history of the Western Plains of Melbourne including the use of the plants by the area’s indigenous inhabitants. Covers a range of gardening-related topics such as attracting butterflies and native birds, creating a frog-friendly garden, growing plants in containers, growing ferns, and native lawns. Descriptions, cultural notes and colour photos of over 200 plants grouped into logical groupings: trees and tall shrubs, aquatic plants, grasses, low shrubs, climbers and wildflowers. A graphic guide to flowering months of each plant described plus symbols indicating bird-attracting and butterfly-attracting plants. Appendices include: living models for revegetation, Ecological Vegetation Classes, indigenous plant suppliers, legislation permits, useful plant lists, further reading, a contact list and a glossary. Maps include Melbourne’s Western Plains, Victorian Volcanic Plains, geology, rainfall and selected Ecological Vegetation Classes found across Melbourne's Western Plains. For complete details of the contents of the book, click here.